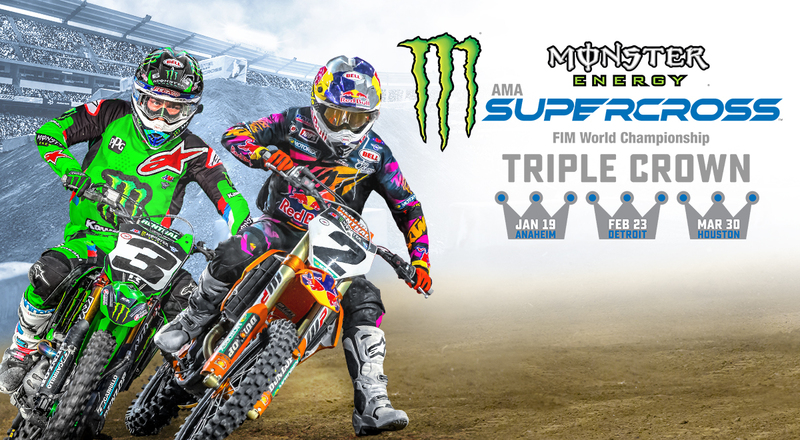 The Monster Energy Supercross Triple Crown is an exciting new racing format that was implemented in 2018. Consisting of 3 MAIN EVENTS fans and racers alike get to experience three gate drops and holeshots! -- The Triple Crown format uses an Olympic-Style Scoring System so 1st place = 1 point; 2nd place = 2 points, etc. -- The rider with the LOWEST SCORE (ex. 1+1+1=3 if a rider wins all three Main Events) gets 1st place, and a full 26 regular championship points. 2nd overall pays 23 pts., 3rd overall pays 21 pts., etc. 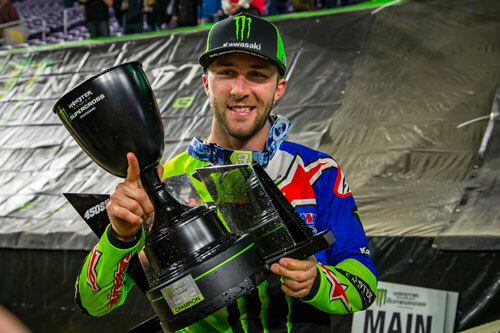 The Triple Crown is also a "championship within a championship," as a rider's results from the three Triple Crown races in Anaheim 2, Detroit and Houston will be tallied to declare an official 2019 Monster Energy Supercross Triple Crown Champion! 2019 Triple Crown Champion: Cooper Webb!